Here is a genre film that positively cries out for the 70mm frame. The Revenant consists of a few characters drawn in broad strokes, performing the actions we’d expect of their archetypes. They occupy a story that, being critical, is fairly simplistic and a little pulpy, and sticks the landing more or less on a technicality. I’m not sure that the criticism matters all that much; the primary purpose of adventure cinema is to invoke feeling, and the film provides a visceral tether between us and characters that - on paper - have more in common with mythic figures than human beings. That tether comes courtesy of two rather superb central performances, and a vividly realized sense of time and place courtesy of terrifyingly good cinematography and editing. And director Alejandro G. Iñárritu keeps an even handle on the film’s tone, shifting from realism to surrealism according to some wonderful discipline that’s always on-key without ever really announcing itself. What happens on a storytelling level within this canvas isn’t too far removed, strictly speaking, from those high-adventure pulp magazines from the fifties; those were the ones with titles like “Red Tide of Death” and “Devil in the Deep” (the movie passes on the rampant misogyny, thankfully). 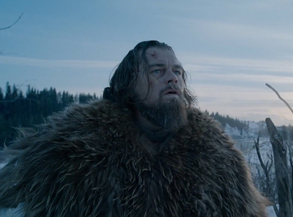 Leonardo DiCaprio plays Hugh Glass, an expedition guide with a hunting party somewhere in the northern region of the Louisiana Purchase, roughly where the Arikara tribe settled. Tensions between the two over pelts lead to a film-opening attack sequence that’s the first (and longest, I believe) of the movie’s four main structural set pieces. We get a few moments before this pandemonium; we’re introduced to Glass, as well as the captain of the expedition, Andrew Henry (Domhnall Gleeson), and John Fitzgerald (Tom Hardy), but only enough to learn names and the broadest outlines of the main character’s relationships to each other.